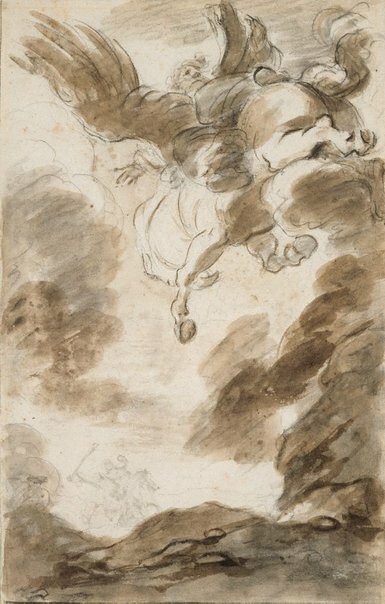 In the 1780s Fragonard made a series of over 100 lively drawings inspired by Ariosto’s epic, 'Orlando Furioso'. First published in 1516, the fantastic poem relates the struggles between the Christians and the pagans. Unfortunately there is no 18th-century documentation to tell us why Fragonard undertook such an ambitious project. In the 19th century the drawings belonged to the great Fragonard collector, Hippolyte Walferdin, who purchased them from the artist's family. The series was kept intact until 1922. Portrait of a Gallery , 'Prints & Drawings', pg. 115-122, Sydney, 1984, 118 (colour illus.). Nicolas Draffin, Art Gallery of New South Wales handbook , 'Prints & Drawings', pg. 109-124, Sydney, 1988, 113 (colour illus. ).